A new phone accessory called Sgnl is the exact opposite of a hands-free device like a Bluetooth headset—it’s entirely dependent on your hand. The device, which has blown its Kickstarter goal of $50,000 out of the water, is a high-tech watch band that can be attached to any watch face, whether it’s an Apple watch or an analog timepiece, to let you make phone calls using your hand. Sound is a vibration, and it can move through your body. Sgnl transmits those vibrations from your wrist through your hand, so all you have to do to hear your call is touch a finger to your ear, either on top of the tragus (the piece of cartilage that partially covers your ear canal) or in the earhole itself. 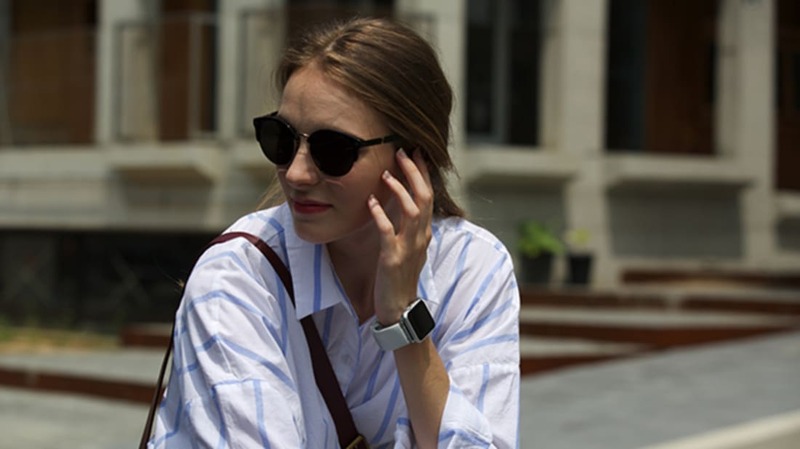 The device connects to your phone via Bluetooth, and you just need to push a button on the strap and lift your hand up to answer calls without having to put on a headset or find your phone. With your hand to your ear, the microphone at your wrist naturally ends up near your mouth. At $139 per wristband, it’s a serious investment for something that sounds a little gimmicky. But while prototypes that mental_floss got a peek at were a little clunky, Sgnl did manage to transmit a pre-recorded message over the din of a coffee shop during the 4 p.m. office worker rush, and to be honest, it does feel a little magical. Because you’re putting your finger over your ear and letting the sound carry through your hand rather than through the air, the device ends up cutting down on background noise and making your call clearer. The current model offers a battery life of four hours of talk time, or seven hours of standby, making it ideal for shorter calls (you wouldn't want to have an hour-long chat with your finger in your ear anyway). Sgnl certainly isn’t the most stylish wrist accessory, but frankly, neither is the Apple watch. It’s probably not cool enough to sacrifice your Rolex’s cachet, but it won’t look terribly out of place with current smartwatches. The band has to be thick and a little stiff in order to fit the Bluetooth receiver and microphone, and it’s undeniably suited to men’s wrists and large statement watches rather than women’s smaller limbs or more delicate watch fashions. But with a little tweaking, it’s easy to see how a device like this could go mainstream. The watch band design fits seamlessly enough into regular life that it doesn’t feel like an extra device you need to wear, like a fitness tracker or yet another wearable taking up wrist real estate, as much as a high-tech upgrade to the accessory you are going to wear anyway. The Sgnl Kickstarter ends this week, and devices will ship in February.